I decided to go with my version of a menswear-inspired layered look for local designer Jason Matlo's trunk show at Fine Finds in Yaletown a few weeks ago. Jason was in-store showcasing his Babe Collection, which is full of fun dresses in flirty colours and styles. I also had a great time browsing the store (if you haven't been to Fine Finds before, it's basically the mecca of all gift stores), sipping on champagne, and chatting with some of my lovely blogger friends. For pictures from the event, check out Tina's blog and Kerri's blog. 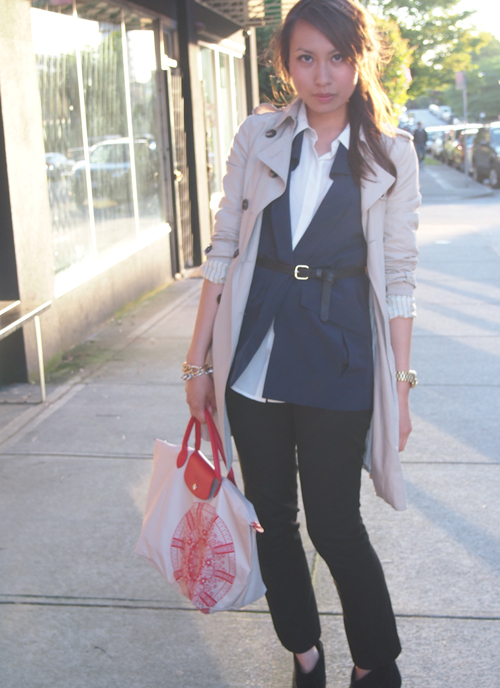 You look great - love the longchamp bag and aritzia trench - so chic! I love menswear - one of my faves. That trench looks great. great layering! You look like a model! You look great here! Very crisp and classic. Love your layers! Layering is definitely something I have yet to master and you did it perfectly. Plus, your menswear-inspired look has just the right combination of masculine and feminine. I love the menswear look! You look very cute, Alison! Another great outfit! LOVE the Longchamp btw. Great style! I love how the belt pulls it all together - you look very chic! Love this look - the belted blazer is awesome! love this blouse and also your blog! It's so nice!!! I follow you! I'm in about to delete my blogger profile but will follow again once I've set up my new wordpress profile. Just recently changed my blog address to stylelounge.com... so it's starting over once again! Ah, I'll update my bookmarks! Super cute! 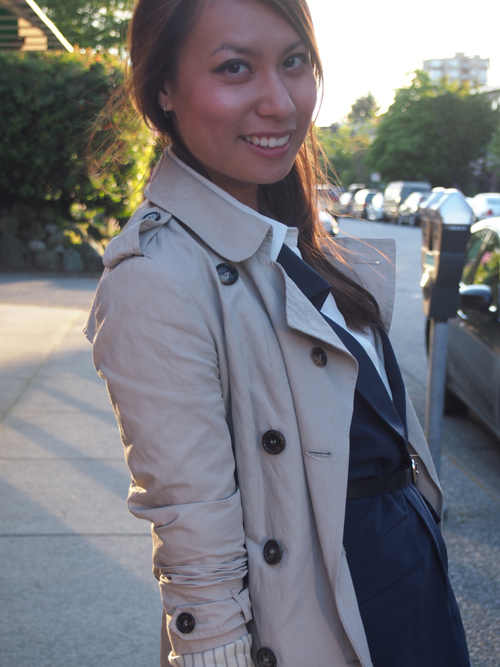 I especially like the trench coat in this look :) I love menswear-inspired looks for women! I love this inspiration. Every item goes so well together! LOVE it! really loving this menswear inspired outfit! cool outfit, I really like your vest, would you like to follow us each other? I can aslo follow you on twitter and bloglovin. i love this!! you seriously rock menswear so well!! i love love how you layered this outfit! This is great! You made the outfit so classy and feminine! Perfectly classic! I always love your Galeries-Lafayette Longchamp tote, and those booties are just perfect. Love them. I have totally been over-wearing these booties lately... I don't know why I didn't get a pair sooner! great job with layering.. didn't know it's still cold there :O then again weather has been crazy lately! Beautiful layering :) you look fab! I'm in love with this outfit. I like how you layered each piece and the trench including ankle boots are perfect addition to the outfit.